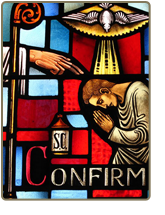 Confirmation is usually received as a teenager, several years after making First Communion, and is considered as the second of the three Sacraments of Initiation. Confirmation is regarded as the perfection of Baptism. by the sacrament of Confirmation, are more perfectly bound to the Church and are enriched with a special strength of the Holy Spirit. Hence they are, as true witnesses of Christ, more strictly obliged to spread and defend the faith by word and deed. Call 428-6426 or Maria Bilodeau at 386-690-4023 for more information.